Note: tent in background still looks lively. 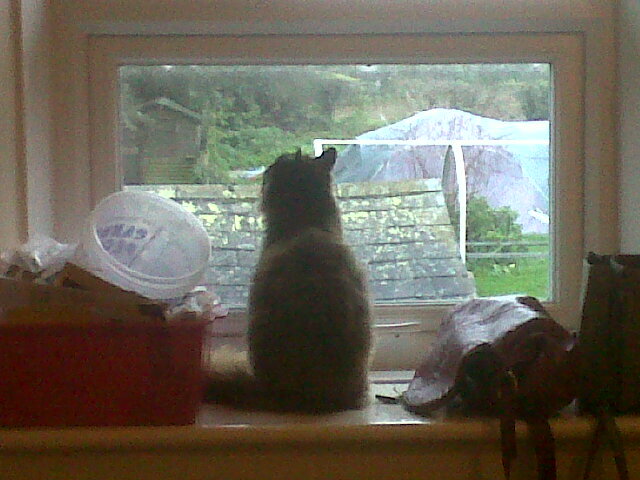 Cat sits on an upstairs windowsill, watching the storm pounce. It may catch a bird or two for her. The birds are erratic, jerking like unpractised stunt kites. Cone headed Dog is caught in a cross wind, I hold her lead tight but she stays ground based. Trees grow a voice from the storm, from a whisper to a full dragon's roar. 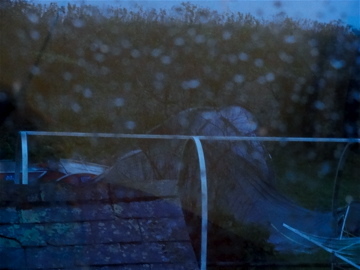 In the garden the big tent jelly wobbles, holds fast, is assassinated by a flying plank. On the road to Bude stretches of glossy black water sidle over the tarmac. They look sticky and steal all traction.